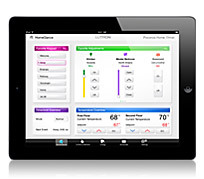 Lutron RadioRA2 Lighting and HVAC Control! Lutron Sivoia QS Triathlon is the most fashionable, flexible and affordable motorized shading system available today. This battery-powered solution offers industry-leading battery life for easy installation and maintenance, perfect for retrofit applications. 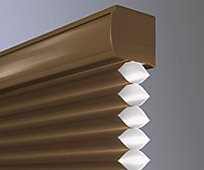 Available in new roller shade or insulating honeycomb styles, these shades have a wide variety of beautiful fabric colors and textures to meet the functional and aesthetic needs of any space. Able to work as a standalone or system solution, these shades can be controlled at the touch of a button. Have you ever dreamed of a fully automated home? Orange Coast Audio/Video & an HAI Automaiton System can make your dreams of an automated home come to life! A home that turns your temperature down when you're away for energy management. A home with lighting sequences for "good night", "good morning", "romantic", or "entertainment". A home where your music from the den follows you down the hall and into the kitchen. A home that can be securely accessed and controlled by you from anywhere in the world. A fully integrated home that offers you comfort, convenience and safety. Click on the HAI logo for a Smart House tour! How would you like to keep your home comfortable and save money on your energy bill? According to the US Department of Energy approximately 56% of an average home's energy usage is for its heating and air conditioning (HVAC) system. 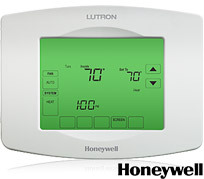 Using an HAI Omnistat2 thermostat will reduce your home energy costs. Omnistat2 thermostats let you automatically schedule your heating and air conditioning settings based upon the day of the week and time of day. They allow you to set back temperatures when you are not home and to warm/cool the home to your desired temperature for when you return home. Omnistat2 thermostats learn the heating and cooling patterns of your home using an advanced process developed by HAI in conjunction with the US Department of Energy. By learning these patterns the Omnistat2 maximizes the efficiency of your HVAC system to keep your home at the comfortable temperature that you have set. Check out HAI's new 5.7" color touchscreen home controller. Adjust the lights, turn on your security, place your thermostats in the auto mode, view your front door camera or select your music... or do all at the same time with the push of a button. Home Automation is here now! Click on Touchscreen to run flash demo. How do you wish to interact with your home control system? HAI offers many options to access and control your Omni or Lumina family system. Choose from one of the Touchscreens, consoles, keypads, or software interfaces. HAI has several software programs that allow monitoring and control of your home via the Internet. Some software is intended to be used on a home computer, while others can be carried with you and used on any computer in the world. HAI has several software and hardware packages that allow complete home control from the comfort of your couch. HAI's software packages do not require a subscription. HAI’s software turns your BlackBerry™, iPhone™, Smartphone or PDA into a remote control for your house! Lighting Control: Simply Automated manufacturers a line of lighting control switches using UPB (Universal Powerline Bus)technology. UPB transmits it signal thru the homes electrical wiring making everyhome capable of achieving full lighting control and automation. Lights can be programmed to turn on or off by events, such as the arming of a security system or by time such as sunrise of sunset. Visit HomeAutomaiton.com for additional reference material on home automation for today's digital home, including lighting, climate, entertainment, and security controls see go to www.homeautomationinfo.com. Many folks believe home automation is only feasible to install when building a new home. With the advent of wireless solutions a retrofit installation is much more affordable than in the past. However planning for home automation when building a new home remains the optimum opportunity to install the technology of your choice and save on infrastructure costs.